Ceremony ~ how it beautifully marks the passages and seasons of our lives. In this way, my husband Walt and I chose to include in our wedding two Essential Bowls. One, a large sunflower yellow mixing bowl, passed down from his Grandmother, that was the center of attention for any real and jovial family gathering. And, one from my Grandmother, pottery of painted terra cotta from Mexico ~ also once a vessel for delectable dishes of southwestern influence when extended family gathered. In this way, we brought our heritage and fond memories to our Day…. 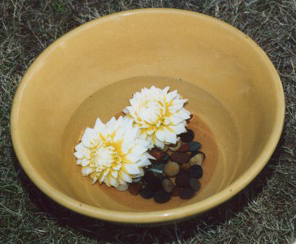 The large yellow bowl was filled with clear water, and into it, each person present placed a stone, imbued with a blessing. 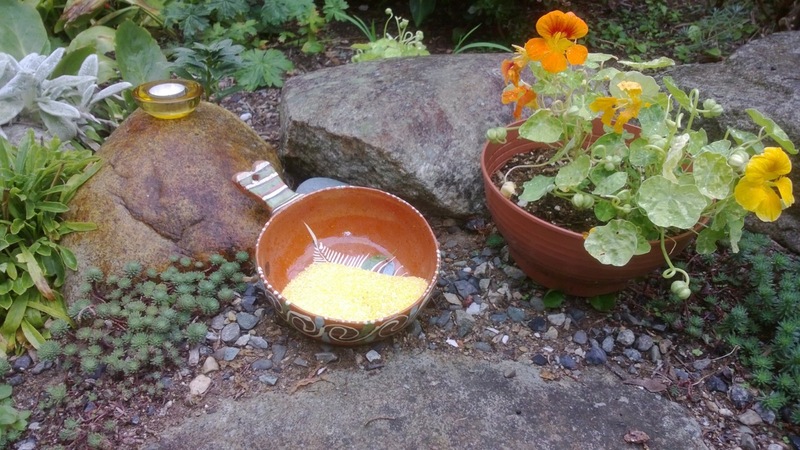 As well, the pottery held fine-grained cornmeal, which outlined our Circle into sacred space, thus invoking the four directions, parents, Grandparents, and families past and present.